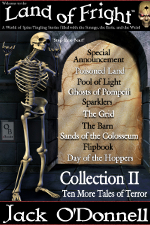 Collection II contains horror short stories #11 thru #20 from the Land of Fright™ series. The second set of ten stories in Land of Fright™ are available separately on Amazon, or in this convenient Land of Fright™ – Collection II boxed set. Free to Read with Kindle Unlimited! Special Announcement – A fraud investigator discovers the disturbing truth behind the messages on a community announcement board. Poisoned Land – Savage hunters patrol the Poisoned Lands, demanding appeasement from the three survivors trapped in a surrounded building. Pool of Light – A mysterious wave of dark energy from space washes over the Earth, trapping a woman and her friends in pools of light. Beyond the edges of the light, deep pockets of darkness hold much more than just empty blackness. Ghosts of Pompeii – A woman on a tour of Italy with her son unwittingly awakens the ghosts of Pompeii. Sparklers – A child’s sparkler opens a doorway to another dimension and a father must enter it to save his family and his neighborhood from the ominous threat that lays beyond. The Grid – An interstellar salvage crew activates a mysterious grid on an abandoned vessel floating in space, unleashing a deadly force. The Barn – An empty barn beckons an amateur photographer to step through its dark entrance, whispering promises of a once-in-a-lifetime shoot. Sands of the Colosseum – A businessman in Rome gets to experience the dream of a lifetime when he visits the great Colosseum — until he finds himself standing on the arena floor. Flipbook – A sales rep sees a dark future when he watches the tiny animations of a flipbook play out in his hand. Day of the Hoppers – Two boys flee for their lives when their friendly neighborhood grasshoppers turn into deadly projectiles. 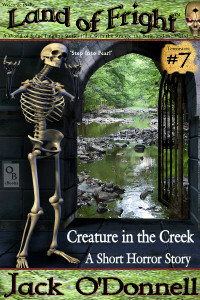 The second set of ten stories in Land of Fright™ is available on Amazon in this convenient boxed set. Free to Read with Kindle Unlimited!